Rosemina lives in the rural community of Guedon. Her father and mother are unemployed. Jobs are not always available. Rosemina has 2 sisters and 2 brothers. For fun, Rosemina enjoys playing dolls with her friends. She is in Preschool 2 where her favorite subject is drawing. 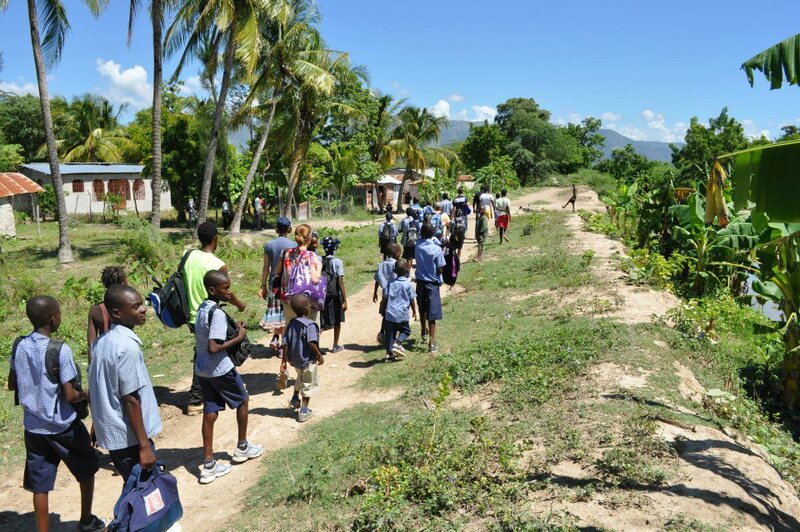 The above photo is of children walking to or from school in the rural community of Joineau, one of the communities in which Mission to Haiti has a sponsor school. People in rural Haitian communities live a couple centuries behind us in regard to technology and developments. Though cell phones, TV and Internet are available in the cities, many in the rural areas have never seen a television, been on the Internet or used a cell phone. It is common to have to walk a mile for clean water, and if a child has the opportunity to attend school, he or she may have to walk a couple miles to get there. If you are interested in sponsoring Rosemina, head on over to missiontohaiti.org.